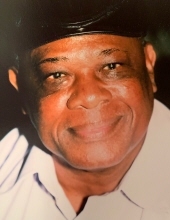 Willie Lee Mills, beloved husband, father, grandfather, brother, uncle and friend passed away on Monday, April 8, 2019 at the age of 83. Willie, son of Willie Mills, Sr. and Jannie Mae was born on November 28, 1936. He was united in Holy Matrimony to Rosa Mae Mills and to this union 6 children were born. Willie is preceded in death by his loving, faithful wife Rosa Mills and by 3 of his children, son, Leon Mills and two daughters, Danielle Mills and Debra Mills. He leaves to cherish his memories, two sons, Adam Mills and Andre Mills; two daughters, Azora Mills and Tammy Mills; two sisters, Mary Toson and Liz Micnopy; four brothers, John Henry Solomon, James Solomon, Freddie Solomon and Ronnie Solomon. He is survived by 6 grandchildren, Angela Jones, Anthony Hall, Tiffany Reid, Ronda Reid, Aleah Mills, Aaron Mills and 5 great grandchildren, Marion Jones, Mariyah Jones, Wendell Simmons, Devin J. Jackson, Gamail Mohamad and a host of relatives, friends and all who knew and loved him. To send flowers or a remembrance gift to the family of Willie Lee Mills, please visit our Tribute Store. Viewing Friday, April 19, 2019 4-7 PM and Saturday, April 20th 9:00AM until start of service. "Email Address" would like to share the life celebration of Willie Lee Mills. Click on the "link" to go to share a favorite memory or leave a condolence message for the family.